​The Southern Arizona Arts & Cultural Alliance is dedicated to the preservation, advancement and creation of the arts. By supporting and developing innovative community arts programming, we help create communities capable of positive, diverse and equitable public dialogue and action. We believe the arts provide a tool for mobilization and build community leadership and capacity. The Summer 2019 exhibition is devoted to the introduction, discovery, and promotion of ASU Emerging Artists. The exhibition is being held May 13, 2019 - September 5, 2019. This art call is open to artists who are current or recently graduated students at Arizona State University from Graduate and Undergraduate programs, working in any media. APPLICATION DEADLINE: April 15th, 2019. The Southern Arizona Arts & Cultural Alliance (SAACA), in collaboration with the Town of Sahuarita Parks and Recreation Department, seeks to enhance the cultural environment, visual landscape and the quality of life for residents and visitors to Sahuarita parks. We are seeking experienced and talented visual artists, artist teams and arts organizations to work within communities to create unique temporary artwork on Utility Boxes throughout the Town of Sahuarita. This Request for Qualifications (RFQ) is open to professional artists, artist teams, and arts organizations working in the visual arts who possess the knowledge, creative, technical expertise and the administrative capacity to oversee multiple projects simultaneously. The Arizona Business Committee for the Arts is seeking an artist to create an install a mural on the stairway and landing at the Tempe Marketplace shopping center in Tempe, AZ. This installation of privately owned public art will become a focal piece and popular photography spot within the center. The mural will be painted directly on the face, lip and top of the step as well as the landing at the top of the steps, creating a complete image when viewed from ground level. The project should be an original, OUTDOOR site-specific design fabricated with safe, durable, low maintenance materials. Proposals should be complementary to the overall exterior design of the building. This project seeks artists and proposals that utilize the entirety of the budget for one focal installation and can deliver by a specific date. 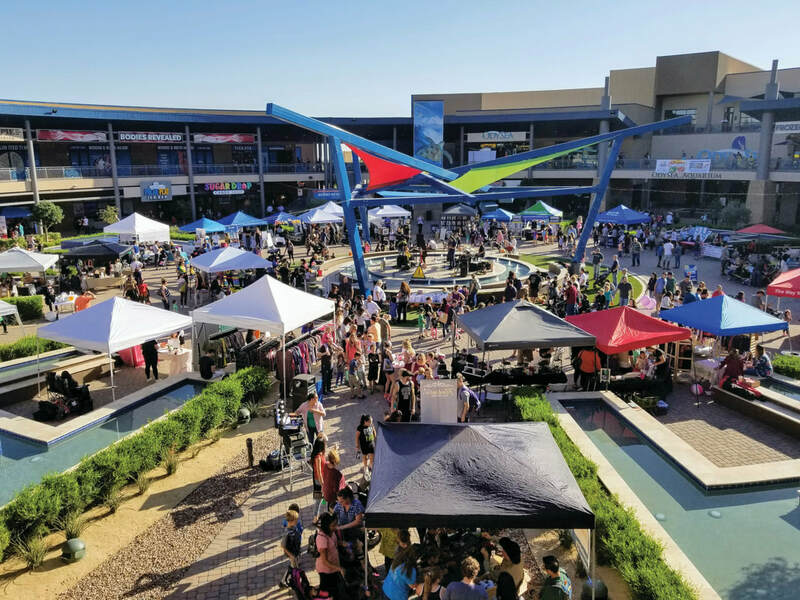 The Tucson Premium Outlets and the Southern Arizona Arts and Cultural Alliance have partnered to bring live music to Southern Arizona each and every week. The Tucson Premium Outlets Concert Series supports local musicians with the opportunity to perform weekly in the community’s largest and only outlet shopping center. The series supports a range in music genres, but focuses on country, folk, western, and Americana. We are seeking Mariachi and Folklorico performance groups for a feaure showcase at our new culinary event in Sahuarita, AZ. OdySea in the Desert and the Southern Arizona Arts and Cultural Alliance have partnered to bring live cultural music and dance to the desert. The Cultural Connections Concert Series supports local performers with the opportunity to educate the community with their unique cultural styles of music and dance. The series will feature a range of performance types, from folklorico and mariachi to taiko drumming and tap dance. Big beautiful, secure studio space for lease with great neighbors at Launchpad Artspace, 3113 E. Columbia Street in Tucson. Studio includes 1,100 SF interior work space plus outdoor space for a total of 1,200 SF. Zoned CI-2 with 220v and compressed air. Launchpad Artspace is comprised of individuals and nonprofit organizations who share resources and collaboratively promote their work. One-year lease is $800, includes utilities and liability insurance. Utilities may slightly increase during summer months. Launchpad Artspace is managed and marketed as a unique art and performance destination by Mat Bevel Company. Tenants are encouraged to participate in group exhibitions in a shared 2,000 SF gallery. Contact: Paula Schaper at 520-604-6273 or pschaper@matbevelcompany.org. Act One and ON Media Publications invite all Arizona artists to enter artwork to be featured on the cover of the 2019-2020 ON Stage Season Arts Preview Guide. Submit a photo of an original piece of artwork that best represents the Performing Arts, specifically the areas of dance, music and theater. One piece of artwork will be chosen for the Metro Phoenix guide, a 100+ page publication that is sent out to more than 150,000 arts enthusiasts, and one piece of artwork with be chose for the Tucson guide, with 80+ pages and distribution of 50,000+. In addition to his/her artwork appearing on the cover, the winning artist will also receive a half-page bio in the publication and a $250 honorarium. ON Stage is produced by ON Media Publications in conjunction with the arts organizations featured in the guide. Proceeds from the production of ON Stage benefit Act One, a nonprofit organization that brings more than 44,000 students on educational arts field trips every year. ​Media: any artwork that can be hung on the wall; no smaller than 10” or larger than 42”on any side including frame. When used, glass should not exceed 36 united inches (H +W). Any larger pieces must use artist quality acrylic glazing, if needed. Framing is required on canvases that are less than 1 ½” deep. Mixed media that is three dimensional but can hang on the wall is allowed. Awards: Cash awards will be given for Best of Show, Award of Excellence, Award of Merit and two Honorable Mentions. ​Registration Deadline: April 22nd, 2019. Community Food Bank of Southern Arizona would like to invite local Tucson artists to participate in the Need2Nourish Exhibit on Saturday, May 4th, 2019 at Steinfeld Warehouse Community Arts Center. The Need 2 Nourish Exhibit looks at both the need to nourish our bodies and the need to nourish ourselves through artistic expression. A portion of art sales will benefit the Community Food Bank of Southern Arizona. The Community Food Bank responds to the root causes of hunger and seeks to restore dignity, health, opportunity and hope to people living in poverty. Our mission is to change lives in the communities we serve by feeding the hungry today, and building a healthy, hunger-free tomorrow. To register for FREE or for more information, please contact Karrington Hamilton at khamilton@communityfoodbank.org or at 520.622.0525 ex. 7205. When registering, please have JPEG image available of artwork. Artists are invited to portray the idea of what is hunger or what is nourishment as it relates to our community. CFB will provide supplemental information to understand the work the Community Food Bank does in Southern Arizona. If artists would like to submit more than two pieces, please contact Karrington Hamilton. All mediums welcome. No prints or copies, except photography. If piece is larger than 4’ x 6’ ft, please contact Karrington Hamilton. All submissions must be perceptible and appropriate to all ages. All artwork must be sent wired and/or framed (if applicable) and ready for wall or table display. Artists agree to a 50/50 commission split. Half of the funds will go to the artists and half will go to support programs at CFB. Any pieces not sold may be retained by the artist or donated as an in-kind donation(s). Registration Deadline: April 22nd, 2019. To register, please contact Karrington Hamilton. When registering, please have JPEG image available of artwork. Drop Off Dates: May 2nd, 2019 2 PM – 7 PM and May 3rd, 2019 10 AM – 3 PM. If piece isn’t sold, please confirm donation to Community Foodbank or pick up by May 5th, 2019 from 9 AM - 2PM. Insurance and Liability: All artists are responsible for insuring their own work and may be responsible for mounting and dismounting pieces in their designated spaces of the gallery. Steinfeld Warehouse and the Community Food Bank of Southern Arizona do not cover loss or damage of the artwork. We suggest that artists carry their own insurance.